Mary Corse (b. 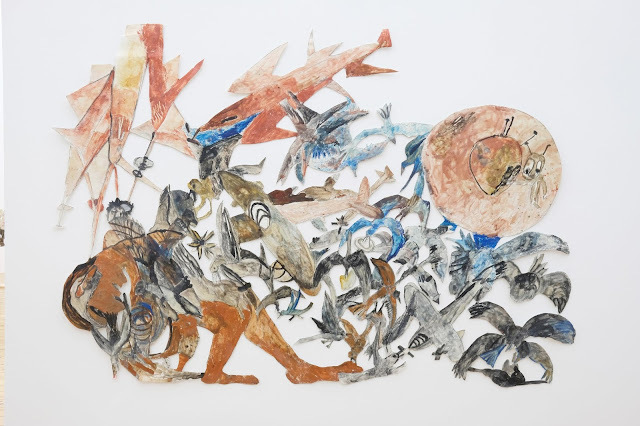 1945), Untitled (White Multiple Inner Band), 2003. Glass microspheres and acrylic on canvas, 96 x 240 in. (243.8 x 609.6 cm). Although as the artist has pointed out that words are not the best way to describe her work, however, for those that are not familiar these words should aid as an introduction. 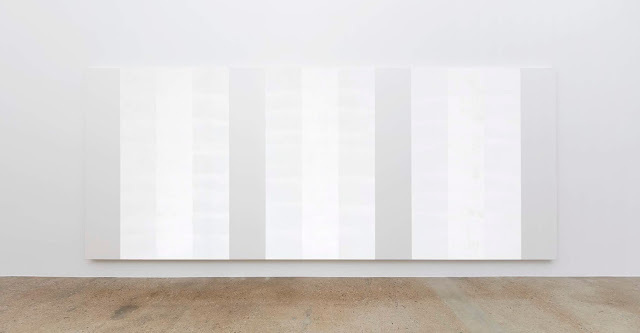 For decades, Mary Corse has been experimenting with painting light onto canvas. Her practice is a combination of art and science. 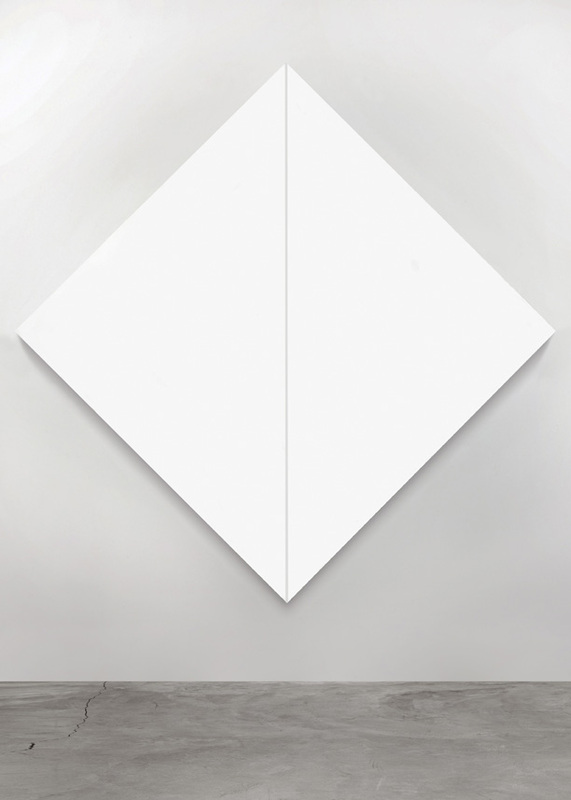 If this does not make her stand out from her contemporaries of the West Coast Light and Space Movement of the 1960s, then her tenacious focus on exploring the two dimensional surface of painting sets her apart from artists such as James Turrell and Doug Wheeler. Of her practice, Corse uses the two dimensional space to capture a certain quality of light that moves as viewers move within their physical space. Her works are self-referential in the way that the paintings emphasize physicality and material. Her investigation centers on the spatial relationship between object and space. Corse's paintings are formal, their surfaces show almost no trace of the artist's hand. Yet, there are gradient changes and brush marks that surpass the presentation of pure geometry. From June 8th through November 25, the Whitney Museum of American Art presents Mary Corse: A Survey in Light. It is the first museum survey devoted to the work of Mary Corse (born 1945, Berkeley, CA; lives and works in Topanga). For the brilliant and ambitious artist, much of her work has not garnered the kind of attention she truly deserves, that is until now. Mary Corse (b. 1945), Untitled (White Diamond, Negative Stripe), 1965. Acrylic on canvas, 84 x 84 in. (213.36 x 213.36 cm). Mary Corse (b. 1945), Untitled (Two Triangular Columns), 1965. 92 x 18 1/8 x 18 1/8 in. (233.7 x 46 x 46 cm) and 92 x 18 1/16 x 18 in. (233.7 x 45.9 x 45.7 cm). For a brief time in the mid-sixities, Corse did experiment with making sculptures yet she considered the process like making two dimensional works. 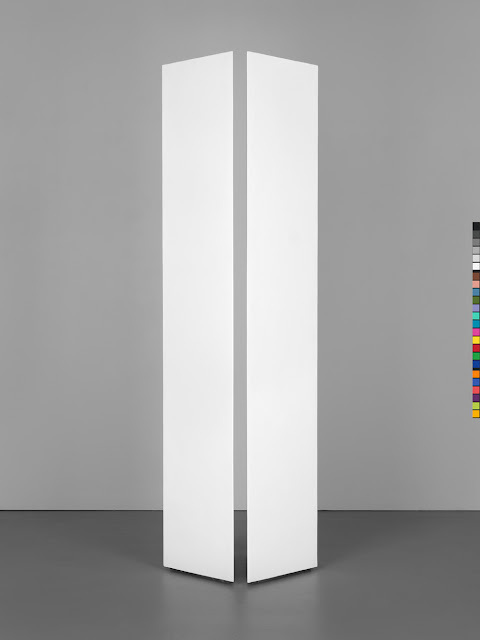 In 1965, she made Untitled (Two Triangular Columns), when viewed in person the flat surfaces in many ways are more similar to paintings than representing three-dimensional objects. To explore visual perception of spatial relation, the artist built two pairs of identical triangular columns. Rather than sculptures in the round, the artist focused on how the columns occupied physical space that could appear as straight lines dividing down a geometric plane. Untitled (White Diamond, Negative Stripe), 1965 an acrylic work on canvas translates the same idea of a line dissenting a visual plane creating a negative space that separated it into two parts, thus creating new geometric shapes. The result of these works examines the phenomenon of visual perception. While the "White Diamond" contains two right triangles made by a line in the middle creating a negative space. The "Columns" are like two flat rectangles representing a two-point perspective on two-dimensional drawing. Mary Corse (b. 1945), Untitled (Black Earth Series), 1978. Ceramic, two tiles, 96 x 48 in. (243.8 x 121.9 cm). In 1970, Corse left her downtown Los Angeles studio moved to Topanga Canyon. The region's rocky hills prompted the artist to experiment materials that were naturally occurring. She manually modeled clay off a large flat rock found near her studio, then fired and painted using opaque black glaze. 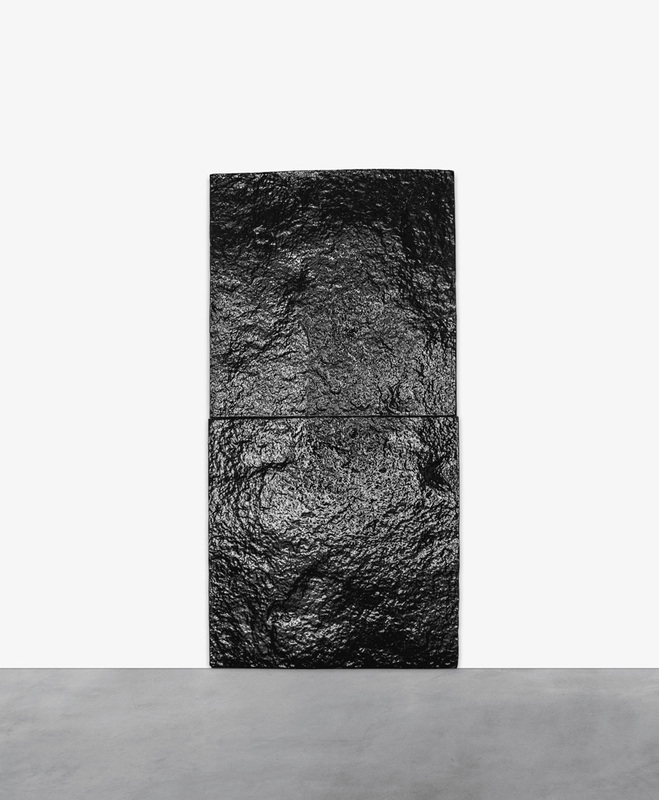 This Black Earth series initiated around 1978 began her fascination with material and process. As Corse herself referred to them as "earth paintings," they reflect an artistic period of returning to the earth after years of making ethereal White Light paintings. Untitled (Black Earth Series), 1978 like the the light paintings has a reflective quality due to the metals contained in the material. On this quality of the earth's natural metals' ability to catch light, Corse describes these works as the "transition between the white light consciousness and the heavy, earth-grounded" like subtle illumination. This exhibition at the Whitney- Mary Corse: A Survey in Light is largely organized chronologically. As the first image of this article shows, Corse continues to explore the theme of perception in light as both a subject and material. In this regards, her interest aligns with that of the West Coast Light and Space movement. However unlike the aforementioned artists who present the experience of light through the use of space, Corse presents the physical and metaphysical qualities of light through the use of two dimensional surfaces and thus creates a experience that defies the conventional notion of painting as just flatly pictorial. White Light, 1969; 16 mm film transferred to video, color, sound; 9:10 min.